We had a lovely Meet to Delete! event in Bruxelles at Galerie Up as part of Julian Priest project The Weight of Information. The Gallery is a small 20 square meter space in the Saint-Gilles area of Bruxelles, launched and owned by Clarisse Bardiot. On the left side of the Gallery we put a small round table with a shredder and a pot with colored pens. 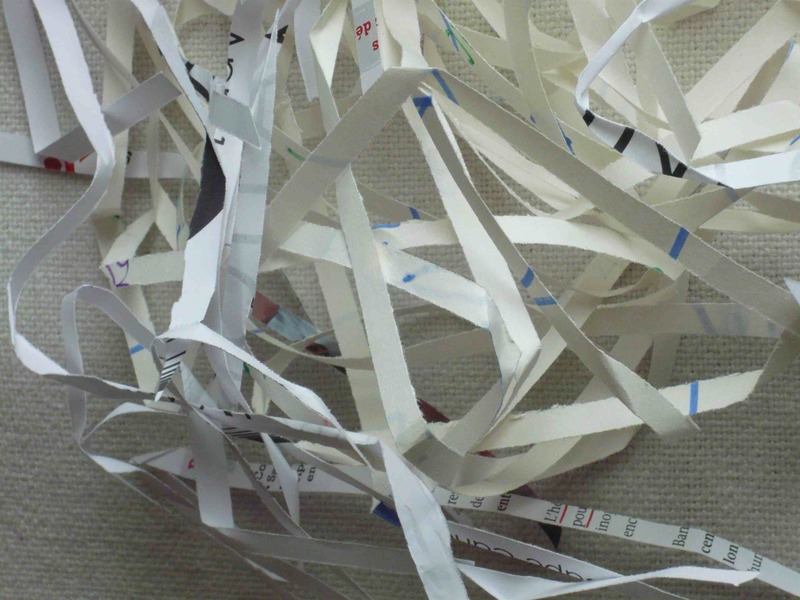 People could sit at the table —or stand by it— to shred the documents they had brought or delete datas from their cell phones, in a symbolically intimate and focused act. Next to the table, we had suspended a roll of paper onto which people could write their first name and the nature of the infomation they just deleted. On the right side of the Gallery, we videoprojected the orbital path of the satellite. A candle was lit in the opposite corner as an evocation of the bonfire we could not do indoors. A poster was displayed next to it, another one was on the door of the gallery and 3 others on the gallery window. A 9 slide Power Point about the project was available on an iPad for people to browse. Drinks and light snacks (chips, olives) were served. At the end of the event, Clarisse and I took a picture of the roll of paper, then we shredded the roll and the posters, and we blew up the candle. The meta data of the event that we shall keep are the list of items written on the roll, samples of shredded documents and the picture of the shreds. About 20 people attended the event, among them some children. Most of them came around the same time, which allowed for nice exchanges. Many questions were asked about The Weight of Information satellite and the whole project.
. Deleting data and information belongs to the private realm, doing it collectively is, in a certain manner, sharing some sort of privacy.
. Every one reported that they had to think about what they would delete.
. It is difficult to decide and choose what to delete [in the framework of the Meet to Delete! event], it is giving a weight to something that has no —or no more— value, that we want to get rid of and in a kind of a paradox giving it, for this moment, a central place.
. The notion of loss was also mentioned.
. It takes time to delete, that is it takes our attention. There is a sort of paradox to isolate mentally oneself from the group to focus on the deleting process. We had also many informal conversations, some related to social and political issues of (storing) digital data! For me, the most lovely moment was when one of kid, after having understood what it was all about, deleted « 2 files from his DS ». It was a joyfull and friendly event, extremely rewarding intellectually and in terms of human relations. Thank you Julian for this beautiful project, Clarisse for having hosted it and Alexi for the caring support, everyone that came to Galerie Up and Zac for the idea of the Sprite satellites. This has allowed for a generous, sharing, poetic and light moment. Ce contenu a été publié dans Blog, Exposition/Curation, Space Art, Space Art, avec comme mot(s)-clé(s) Annick Bureaud, Clarisse Bardiot, Galerie Up, Julian Priest, Space art, The Weight of Information. Vous pouvez le mettre en favoris avec ce permalien.